We are an experienced, innovative Perth based glass company providing very competitive pricing for glass delivery and installation of any commercial project including shops, businesses and offices. Renovating or creating a new office fit-out can prove to be much more cost effective than a relocation. A commercial renovation or office fit-out can bring your work place back up to current standards, improve worker morale, increase productivity and make more effective use of increasingly valuable floor space. Mobile Glass & Glazing is committed to providing the highest quality services available in the commercial fit-out industry. Our expert team is dedicated to working with you to find and implement the best solution that meets the needs of your business. SHOP FRONTS - Our highly skilled team can design, cut, fabricate and install a variety of commercial glass shop fronts. For a sleek, modern look and to optimise the view to the inside, choose a frameless glass option. We will happily discuss all options with you to work out what’s best for your store. DOORS - Automatic doors, bi fold commercial doors, pivot doors, hinged doors, multistack doors, sliding doors – the options are endless. We have a solution for all requirements and any budget. PARTITIONING / PRIVACY SCREENS - Glass partitioning offices and meeting rooms helps provide light and connects spaces, whilst still allowing for privacy and insulation. Glazing options can be tailored to various requirements. GLASS CABINETS & SHELVING - We have extensive experience fabricating custom glass counter tops, cabinets and shelving and can supply associated rail and track systems. We provide on-site measure and quotes and our work complies with all relevant standards and building codes. BALUSTRADE - Glass balustrade brings a sense of luxe to a space, allowing light through and creating a seamless flow between spaces. Available in frameless and semi frameless. CUSTOM WINDOWS - Whatever the requirement, we can custom design, create and install commercial grade windows for every application. LOUVRES - Louvre windows ensure a view is as uninterrupted as possible while the tilt-adjustable panels allow for the control of airflow throughout the area. The unique features of louvre windows can easily be incorporated into any room or design concept. ALFRESCO ENCLOSURES - All enclosures are customized to your needs and requirements and can be matched to blend in to your building. Allowing for year round use of external areas, perfect for maximising space and letting light in. SPLASHBACKS - Easy to clean and customisable to numerous configurations and applications, glass splashbacks are made from toughened safety glass and bring a modern feel to an interior. MIRRORS - Mirrors can create an illusion of more space and bring a warmth to a space. Available in a variety of finishes, mirrors are made from toughened safety glass and can be cut to any shape or size to suit any application. Mobile Glass & Glazing can design and distribute a modern and diverse range of Architectural Systems for interior fit outs, shopfronts and curtain wall applications that enhance the design and function of any building. Fully tested to meet Australian Standards our systems are also WERS Certified and Acoustic Rated. A complete range of technical information is available from our website or contact our team to find out more. The Derwent Glazing System is an ideal economical fixed glazing suite for external locations. Suitable for residential entrance ways, arcades, internal glass partitions and offices, the Derwent is the lightest and most slim line of the multi-purpose Architectural Suites. With its straight cuts and pocket glazing the Derwent not only looks good, but is easy to fabricate and easy to install. Suitable for a range of glass thicknesses up to 10.4mm it has self draining sills that solve water leakage problems. The Derwent also provides a seamless interface with View-Max Window range. 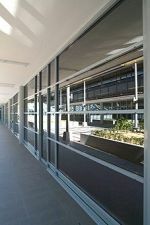 The McArthur Centre Pocket Glazing System is the most popular and flexible of the Commercial Architectural Framing Systems. Available in two frame depths, 101.6mm and 152.4mm it meets the majority of general wind load and span requirements. Ideal for shopfront applications, it is widely favoured by architects for high end residential projects. A feature of the McArthur 101.6mm System is the Double Glazing options which contribute to energy efficiency. With it's straight cuts and centre pocket glazing the McArthur not only looks good, but is easy to fabricate and easy to install. Suitable for a range of glass thicknesses up to 10.4mm it has self draining sub sills that solve water leakage problems. The McArthur also provides a seamless interface with ALSPEC's View-Max Window range, Commercial Sliding Door and the Hawkesbury Multi-fold Door. Mobile Glass and Glazing can supply and install The Hunter Flushglaze System. Is the most versatile and flexible of the Commercial Architectural Framing Systems. Available in two frame depths, 101.6mm and 152.4mm it meets the majority of general wind load and span requirements. Ideal for shop fronts and low rise curtain wall applications.